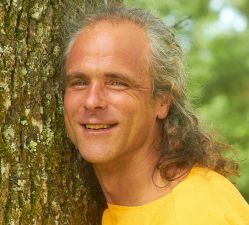 Hartmut, born ´68 in South-Germany, worked as a tree climber to prune trees. The work was intense and he got back problems. By hanging with the knees from a branch, it got better, but he couldn´t hang long enough, because it was painful and he also couldn´t really let go- otherwise he would have fall down. So he developed some “boots” and with a engineer a special pulley system, where he could pull himself slowly up in to the hanging position. He was held by the boots, so he could really let go and his back pains dissolved. After one year of self treatments, he started to give friends a intuitive hanging session and supported them energetic, with different lifts and body postures. He already had many experiences in intuitive healing work before and over the years he learned to thrust his intuition and perception. He also made a course in spiritual massage. Since ´97 he gives Hangab-sessions and since ´04 he teaches with his wife Petra others in Hangab-Workshops. He still feels grace and fascination, how deep and effective Hangab works. His other passion is to share music- to sing prayers and enter together in a sacred space of oneness.